Verbal communication skills are some of the most valuable tools a correctional officer can possess to effectively manage inmates/detainees. 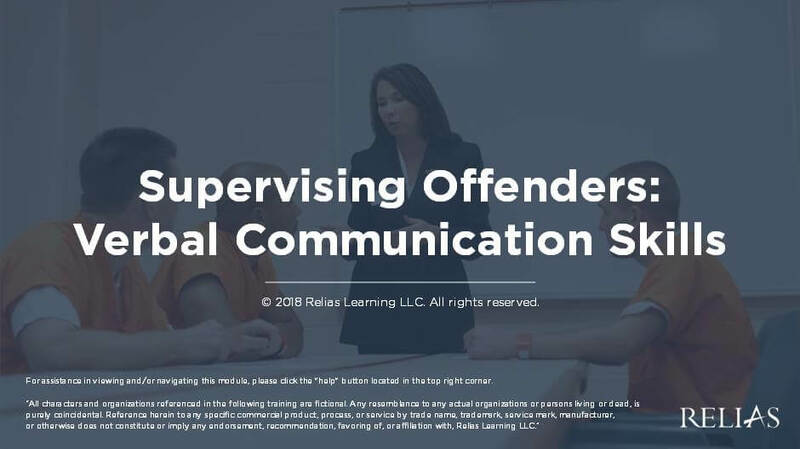 This course will provide officers working in adult correctional facilities with information on using effective verbal communication skills in a variety of correctional situations. Facilities vary in the type of verbal communication skills they endorse or train their officers to use. Some facilities use verbal judo tactics while others promote skills that align with motivational interviewing. This course is not advocating one skill type over another, but rather provides general information that pulls from a variety of different communication styles. Identify 6 reasons why effective verbal communication skills are important in a correctional setting. List 5 strategies for giving directives to inmates/detainees. Explain 4 steps for obtaining information from inmates/detainees. Discuss 8 strategies for mediating and resolving conflict among inmates/detainees. Explain 4 questions to consider when handling requests from inmates/detainees. Mr. Galley began his career with the Maryland Division of Correction (MDOC) in 1967 as a Correctional Teacher at the Maryland Correctional Training Center (MCTC). In 1972, he became the Assistant Warden, and in 1979, he was promoted as Warden of MCTC. In 1981, he became Commissioner of the Maryland Division of Correction. In 1984, he returned to the field as Warden of Roxbury Correctional Institution until 1993 when he resigned to become Warden at the Montgomery County Detention Center. He later served as Chief of Security at the Frederick County Detention Center. In 1999, Mr. Galley returned to the Maryland Division of Correction to accept the position as Warden of Western Correctional Institution. Under his leadership, the Western Correctional Institution became the first Maryland institution to achieve accreditation by the American Correctional Association. He became the Assistant Commissioner of the former West Region in 2007 and the Regional Executive Director of the North Region of the newly reorganized Department of Public Safety and Correctional Services in 2011. He is responsible for the oversight of six (6) major institutions and Community Supervision offices in eight (8) counties. Mr. Galley serves as an auditor for the accreditation program of the American Correctional Association and has done consulting work for the U.S. State Department. He holds a Bachelor’s degree from Frostburg State University and graduate degrees from Shippensburg State University and Southern Illinois University. Disclosure: Jon Galley has declared that no conflict of interest, Relevant Financial Relationship or Relevant Non-Financial Relationship exists. Joe Martin is a career employee for the Kentucky Department of Corrections. Joe started his career as an officer in 1998. Joe was promoted to Sergeant in 2002 and to Lieutenant in 2005. Joe worked and supervised most security positions within a male and female facility while in security that include: Internal Affairs supervisor, Special Management Unit Supervisor, Shift Supervisor, Visitation Supervisor, Adjustment Committee, and Grievance Chairman. In 2012 Joe was again promoted to the Accreditation Manager. In 2013 Joe was promoted to Central Office and started in the PREA Executive department. In 2014 Joe gained his DOJ PREA auditor certification where he served as chair for many PREA Audits in Missouri and Kansas while the KY DOC was part of a consortium with several other states. During his career, he has also served as the Hostage Negotiation Team Leader and active member of the team. Joe’s accomplishments include Commissioner’s and Achievement awards for the department. Disclosure: Joe Martin has declared that no conflict of interest, Relevant Financial Relationship or Relevant Non-Financial Relationship exists. The target audience for this course is: entry level Correctional Officers; in the following settings: Adult Corrections.